In August, I had an opportunity to spend a week at one of my favourite places called Elim Lodge Christian Resort Centre near Buckhorn, ON. Jessica and I have been going to this resort with our families since we were teenagers. Elim has always been a place to relax, study, and seek the Lord’s guidance—not only in the ministry, but also in our family. This year was unlike any other year because the ministry was in the middle of a building purchase that had not been going as planned. Facing numerous hurdles, I asked the Lord to show me what His plan was for this situation. God spoke from His Word through Nehemiah, “You see the bad situation we are in, that Jerusalem is desolate, and its gates burned by fire. Come, let us rebuild the wall of Jerusalem so that we will no longer be a reproach” (Nehemiah 2:17–18). Continuing to seek the Lord, I asked, why this verse? The answer was clear: While trying to purchase an earthly possession, I was drawn off the mission. A physical building, as much as we need more space, is not the highest priority for our ministry. The Hebrew word for reproach is cherpa, which means a shame or disgrace. Nehemiah, in chapter 1, weeps and mourns over reports from Jerusalem that the city has been destroyed. Every time I open the book of Nehemiah, I’m reminded that Canada’s state is much like Israel’s history. We’re surrounded by sin, and destruction is all around us. We’re witnessing the dismantling of the true definition of marriage, family, gender. Truth is being defined by an internal feeling and a personal moral compass, and not the plumbline of God’s Word. My heart breaks for our country, and yet I pray daily for opportunities to lead a major building project like Nehemiah. 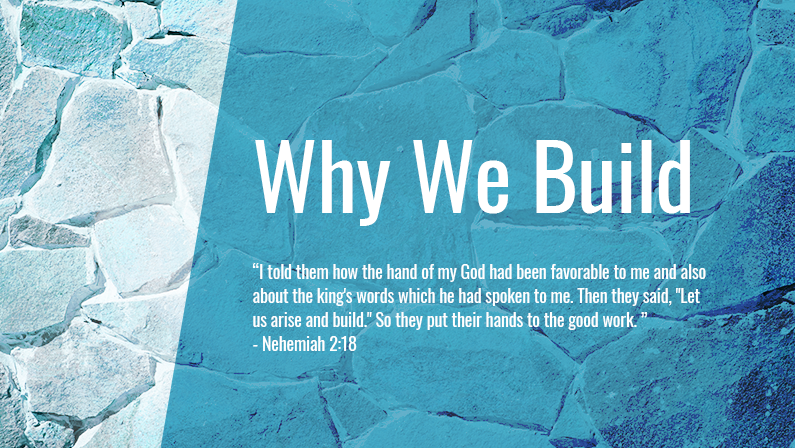 Nehemiah’s building project was to rebuild the walls around the city. It was a means of protection from enemies, but also a sign of strength. Our building project is not a set of walls, but it’s laying a strong foundation in the lives of a believer through a simple Bible study tool called inductive Bible study. Did you know that brick by brick, Precept Ministries has been building on the foundation of the gospel for more than 20 years in Canada? With the newly released study Who Created It?, we now have studies for all ages: from young children learning to read and write, to children in grade school, to students in high school, and adults. Our ministry team of trainers, E-Team members, study leaders, board members, and staff all believe that Precept Ministries is the tool God will use to firm up and prepare believers for the glory of God. Thousands of students are digging in to God’s Word as you read this letter, and yet millions more need the truth. Seek the Lord and ask Him how you can best serve the Lord in partnership with Precept. Yes, I want to partner with Precept so they can continue to raise up and train Bible Study Leaders across Canada!